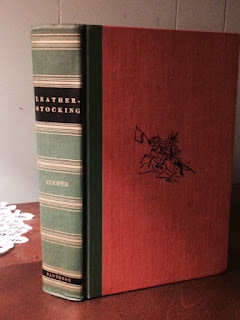 A little while ago, I found a really nice quality copy of the complete collection of James Fenimore Cooper's "Leatherstocking" novels. (Most only know Last of the Mohicans from that series.) I recently bought it in a small antiques and second-hand book shop in Jim Thorpe, Pennsylvania, a quaint former coal town in none other than Carbon County. The book cost me ten dollars. But what really occurred to me while reading this, is the history of the physical book, itself. It is no secret that I am an e-reader avoider. I don't begrudge anyone the benefit of the e-reader and I judge them not. For me, though, reading a book on an e-reader is completely unattractive. This, of course, comes down to mere preference. Carry on as you will. And, now, it waits for me, on a table, next to my reading chair, on a rainy day in October. Tonight, I will pick it up, feel its weight and turn the thick pages. For me, that is important. Sure, I am personifying a book. 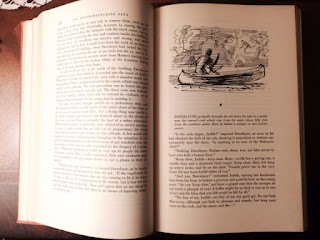 But if you reduce it to the simplest level, a book has weight, texture, scent and presence. An e-book is just a coagulation of light. For me and for many others, a book isn't just its ideas; it's a physical presence in my life; it's a thing with an experience and a journey that doesn't end with me. It will live on after I am gone, but part of me will remain in its pages.